Free diver fishing for queen conch. Credit: Claudio Contreras, International League of Conservation Photographers. The queen conch, a marine mollusk prized for its edible meat and its glossy shell, is one of the most economically and culturally important species in the Caribbean. In the past few decades, intense international fishing driven largely by the demand for export to the United States, has led to declining populations that threaten local fisheries in countries throughout the Caribbean. Some countries have closed their queen conch fisheries, and international trade of the species is restricted by the Convention on International Trade in Endangered Species of Wild Fauna and Flora (CITES). But scientists and conservation organizations still have had difficulty determining what it will take for depleted conch populations to recover. 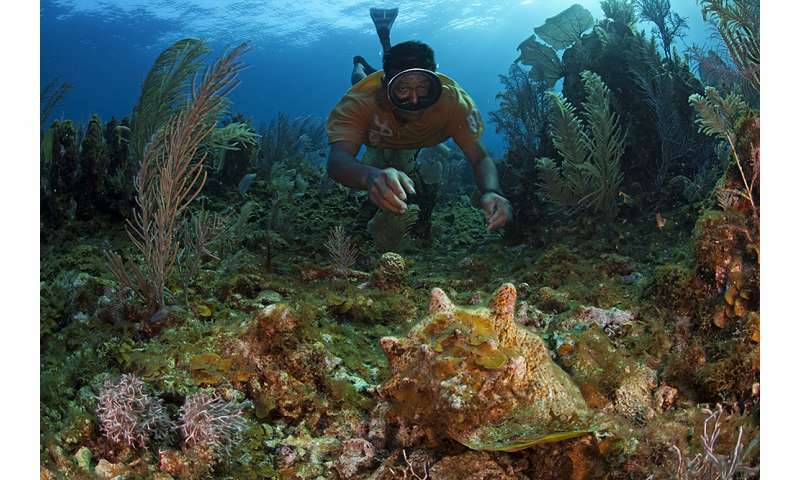 To provide a vital scientific foundation for conservation efforts, an international team led by scientists with the Smithsonian's Marine Conservation Program—part of the National Museum of Natural History's Smithsonian Marine Station in Ft. Pierce, Fla.—has conducted a genetic analysis comparing queen conch at 19 sites throughout the Caribbean. Their findings, published Sept. 19 in the journal Diversity and Distributions, will help scientists understand how local subpopulations of conch are fragmented throughout the Caribbean, an essential first step needed to develop effective science-driven management plans and practices. Nathan Truelove, a postdoctoral researcher at the Smithsonian Marine Station, was part of a large international team overseen by Stephen Box, former director of the Marine Conservation Program. The team found that conch at each site were genetically distinct from individuals at other locations. That suggests that there are multiple population of queen conch in the Caribbean, and that there is little mixing between them. As a result, queen conch fisheries may need to be carefully managed at a local level, as conch from distant locations are unlikely to migrate to and replenish overfished areas. At the same time, the authors say, more international collaboration will be essential to understand the queen conch fishery more fully and restore its populations. For the current study, Smithsonian researchers and collaborators at the University of West Indies in Jamaica; Wageningen University in the Netherlands; Community Conch in Newport, Ore.; the School for Field Studies in Turks and Caicos Islands; the Florida Fish and Wildlife Conservation Commission; Manchester Metropolitan University in the United Kingdom; the Shedd Aquarium in Chicago; Centro de Estudios Marinos in Honduras; and the Centro de Investigaciones Biologicas del Noroeste in Mexico teamed up to obtain queen conch samples from across the Caribbean. 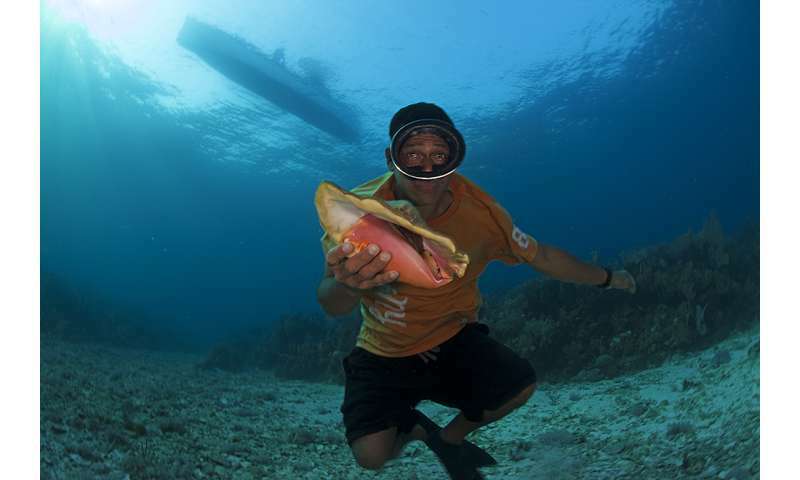 The team collected 643 conch from sites off the coasts of Anguilla, the Bahamas, Belize, the Caribbean Netherlands, Honduras, Jamaica, Mexico, Turks and Caicos, and the United States—often traveling many hours by boat to reach them because waters close to the coast have been so overfished. Each animal was returned to the sea after a small piece of tissue was removed for DNA analysis. At the National Museum of Natural History's Laboratory of Analytical Biology, researchers compared DNA sequences at nine sites in the conchs' genomes and found significant differences between samples from different sites. To better understand these differences, they used oceanographic data to determine the "oceanic distance" between sites. Rather than a simple measure of linear distance, the oceanic distance takes currents and island obstacles into account to provide an estimate of how long it would take an object or animal to drift from one point to another. This is important because, while adult queen conch can't travel vast distances, they do spend the first few weeks of their lives as larvae, moving with the ocean's currents as far and in whichever direction the currents happen to take them. Nathan Truelove conducting field work for this study. Truelove, a postdoctoral researcher at the Smithsonian Marine Station at Ft. Pierce, was part of a large international team overseen by Stephen Box, former director of the Marine Conservation Program. Credit: Nathan Truelove, Smithsonian. 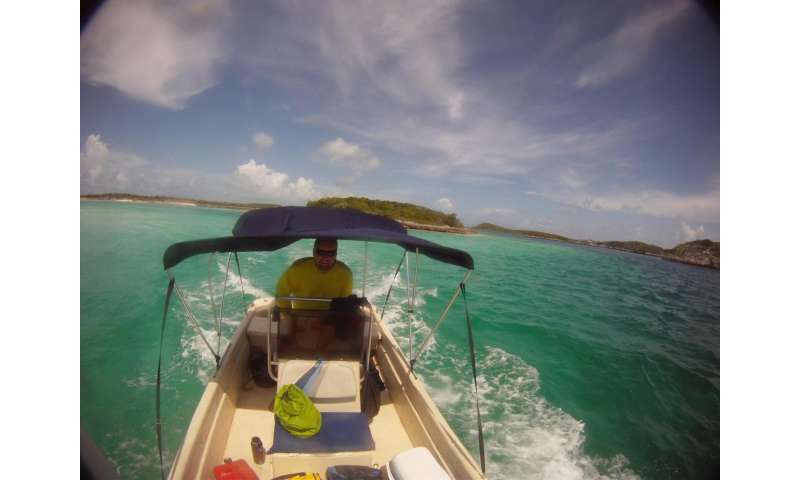 "We conducted this 'oceanic distance' analysis to determine the probability of conch larvae from one site making its way to any one of the other sites that we studied," Truelove said. The researchers found that queen conch from sites separated by the greatest oceanic distances were the most different genetically. "This tells us is that it's not just one giant, well-mixed population of queen conch throughout the entire Caribbean," Truelove said. "If you're in two sites that are not well connected by ocean currents, the chances of your queen conch populations being connected and interrelated are pretty low." The factors that influence the distribution of subpopulations remain to be determined, but Truelove says strong Caribbean currents may act as barriers that keep different groups apart. The findings are a starting point toward understanding the impact of local fisheries. "Our findings suggest that the queen conch fishery cannot be effectively managed as a single stock." In fact, the existence of separate stocks that are isolated by ocean currents may explain why queen conch fisheries in Florida, which collapsed more than 30 years ago, have failed to recover. The next step for researchers will be to determine just how many stocks of queen conch there are in the Caribbean and to map out their boundaries, Truelove said. The relationships identified between the sites in the current study will guide the extensive sampling and analysis necessary for that work.